Manav is two-feet tall and looks like an oversized toy. But that’s where the similarity ends. Built with 21 sensors, two cameras in its eye sockets and two mikes on either side of its head, Manav is India’s first 3D (three-dimensional) printed humanoid robot. Unlike other robots, Manav’s in-built processor and pre-programmed sensors allow it to perform tasks such as walking, talking and dancing “without the help of a laptop, just in response to human voice commands", explained the maker of Manav, 22-year-old Diwakar Vaish, head of robotics and research at A-SET Training and Research Institute in New Delhi since 2010. “It also has two degrees of freedom in its head and neck, allowing it to move its head sideways and up and down—a feature that is not seen in other robots in India. Besides, we are also working on adding a grabber to its arms, so that it can lift objects too," he added. Vaish took two months to design, fabricate, programme and test Manav, using parts that were all made in India. Manav’s outer frame is made of plastic, and it was 3D-printed from Buildkart Retail Pvt. Ltd, A-SET’s own 3D printing venture. “Given that all the parts are made in India, we were able to manufacture Manav at a very low cost. We are selling it at just ₹ 1.5-2 lakh, compared with other robots available in India today that are priced between ₹ 18 lakh and ₹ 20 lakh," said Vaish. “The lower price point will allow more colleges to avail of it, and this plays in very well with the government’s recent ‘Make in India’ campaign. Besides, parts can be easily replaced at a reasonable cost since they are available in India," said Vaish. 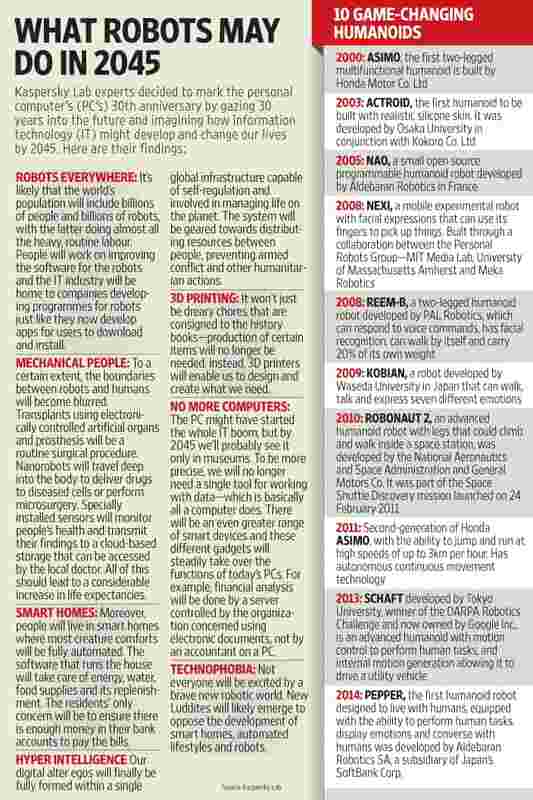 While robots have been around in India since the 1970s, growth and interest in robotics have only picked up pace in the last decade or so. Institutes like IIT Delhi (IIT-D) have also played an instrumental role in promoting the study of robotics at the university level. IIT-D set up the Robotics Society of India on 10 July 2011and holds several robotics workshops and competitions in the country. The Indian Institute of Robotics in Noida, which was started to introduce course curriculum bridging the gap between theoretical and practical study of robotics, is also backed by the IIT faculty. Vaish, a Bachelor of Technology from Delhi’s Sharda University, believes that robots have been restricted to playing behind-the-scenes roles in the manufacturing industry and other remote locations. Keen to help bring robots into the limelight and make them a part of everyday life, aiding the physically challenged or assisting humans in their daily tasks, Vaish is working on five-six prototypes of Manav that have more advanced features and are made from sturdier carbon fibre, compared with the current plastic prototype. “Despite robots being actively used in India since the last 15-20 years, their use has mainly been restricted to research laboratories and not really deployed on a mass-scale on field. The main reason for this is that the majority of components required to make a robot need to be imported, which makes it costly and troublesome in case parts need to be replaced," explained Professor Amarnath Chitta, head of Society for Innovation and Entrepreneurship at IIT-B, and former dean and head of the department of mechanical engineering at IIT-B. Vaish has also been working on a seven feet, life-size humanoid since the past two years that should be available by the middle of this year to research institutes in India and abroad, which can work non-stop for 10-15 hours a day and has the ability to be programmed to perform such tasks that humans would not want to do. “For example, a person in the US could guide the robot in real-time to carry out tasks at nuclear power plants, or a doctor in the US could perform a surgery in real-time on a patient in India, using such a humanoid," said Vaish. He and his team at A-SET are also working on a smart home-automated solution using robotic technology that can sense human feelings and perform tasks without being told like opening doors, turning on the air conditioning sensing an increase in body temperature, switching on the TV to a channel of choice. While this technology is a couple of years away from being commercially launched, Vaish has built over 40 robots till date. These include football-playing robots, writing robots and shadow robots—a robotic arm that imitates a human’s action. Vaish and his team are also working on a wearable mind-sensor headset that can track a person’s attention span and concentration levels, can also read brainwaves and when synced with a robot can accordingly direct the robot to perform human tasks without any human intervention. Having been interested in robotics since childhood, participating in several competitions and workshops, Vaish created his first robot at 18, and then went on to build a variety of other robots, as well as drones. For his work, he has been recognized by former presidents A.P.J. Abdul Kalam and Pratibha Patil, and won the award for the “Best Innovative Researcher 2012" from the UN, according to his Facebook page. Today, besides heading the robotics department at A-SET, he also gives lectures at IITs, NITs, BITS Pilani, VIT university and other institutes, and conducts weekend workshops on robotics. He is now planning to do his Masters’ in Technology and is contemplating patenting the hardware for Manav. “In the last 10 years, growth in start-ups specializing in robotics as well as increased demand for robotics in the manufacturing sector, have led to faster progress in the field of robotics in India and several robotics components manufacturers sprouting in India," Chitta said. “The government’s incentives to the manufacturing industry to ‘Make in India’, similar to its incentives to the hardware industry, could boost the use of robotics in India, to bridge the gap between the technological progress in robotics in India and the rest of the world. That said, humanoids are still at the periphery of the robotics space even globally, as their use for everyday human tasks is still quite a few years away," he concluded.